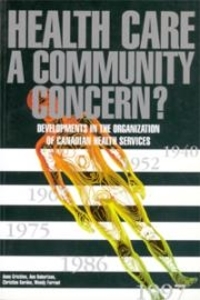 Anne Crichton, PhD, taught health policy at the University of British Columbia from 1969 to 1985. Since retiring, she has been writing on the Canadian and Australian health care systems. She has served on the Vancouver Regional Health Board and is now doing research on this regional board's evolution. Ann Robertson, PhD, has been an assistant professor in the Department of Behavioural Sciences at the University of Toronto since 1993. Her research interests include health promotion, women's health, aging policy and new methodologies for community-based research. She has worked in community development as a Seniors' Wellness Coordinator for the Vancouver Health Department. Christine Gordon, MSc, has worked for a number of years as a consultant in health and social policy and community development. She has been engaged in social change movements, including anti-poverty activism, the promotion of equal opportunity, and disability rights. She is a founder of the B.C. Health Communities Network, the Global Health Network, and the B.C. Coalition for Health Care Reform. 6. From Welfare State to Welfare Society? 30. Where Do We Go from Here?